I just feel better around water. I grew up in Minneapolis, the city of lakes, I lived in Santa Barbara, which is on the Pacific Ocean. And since I live in Phoenix now, I seek out the water of the Salt River. But if you've made the mistake of looking for the water of the Salt River by reading a map that shows “Salt River” on it, you are only seeing where the water used to be. Since 1883 it has been re-channeled into the canals, which are the true rivers of Phoenix. Yes, the canals are the water of the Salt River, that flow all year 'round. Before the canals were built, the Salt River would flood and dry up every year (technically that's called a riparian area). But nowadays the water flows gently all of the time. The water flows from northeast to southwest. And yes, there are fish in it. Also the stray shopping cart or two, as it flows through the city, because people do that kind of stuff. It's a gentle current, and if you really want to see it, go to the Arizona Falls, which is on 56th Street and Indian School Road. 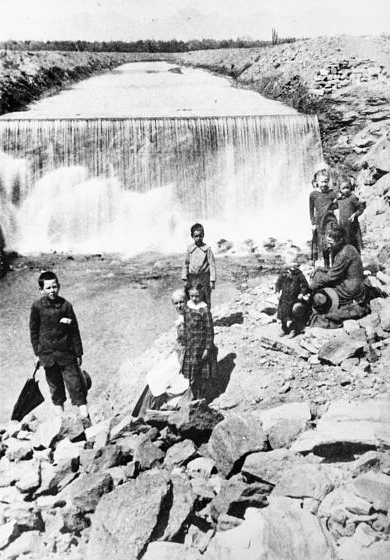 Yes, there is a waterfall there, and yes, it has been there since 1885. One of the most common misconceptions that I hear is that, before people diverted the water, that the Salt River was a quiet, continual, meandering river. It wasn't. It was a typical riparian area that dried up in the summer, and flooded in the spring. And there must have been a time when the thought of taming that river just sounded ridiculous. But it was done, and has been that way for so long that most people take it for granted. I know that I do. Pictured above: the Arizona Falls in 1905, on the Arizona Canal at 56th Street and Indian School Road. Still worth visiting today. Don't worry, they've put railings there now. If you really want to know the Salt, float it in the upper canyon.